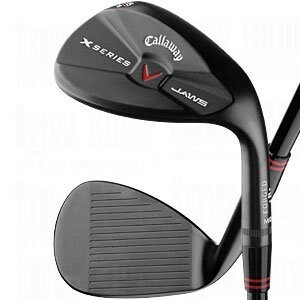 This Callaway Jaws Wedge will bite on the green like a rabid pit bull. Callaway calls these grooves the "Mack Daddy" because they are the maximum conforming depth and width allowed by the USGA. And trust me, they will spin the ball. The C-grind sole has relief in the heel, toe, and trailing edge. This allows you to play a vast variety of shots and get very creative. The sole contour provides for a low leading edge when you lay the face open, thus giving you more confidence to hit the super lob shot without skulling it over the green. This is a fantastic wedge. I really like the look. It has a modern look, but not too flashy. Plus, you can spin the ball from any lie with even half wedge shots. The only con is: it's not super forgiving. I would recommend this club to more advanced players who not only consistently hit the ball on the sweet spot but also like to be creative around the green and try different shots. Another superior wedge that I like is the Vokey Spin Milled Oil Can Wedge. For a more forgiving wedge, check out the Wilson TW9 Tour Milled Satin Wedge.